My wife and I just came back from the Cataract Canyon 4 Day trip and can't say enough good things about it. 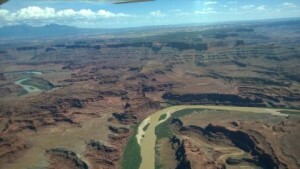 Firstly, this part of the Colorado River is absolutely stunning. If you're new to the natural history and geology of the Canyonland Southwest, this is a great way to see it. Virtually every moment you are surrounded by breathtaking beauty. The trip itself is fantastic. Western River has really got this kind of river touring down to an art. Everything is planned to a tee, obviously optimized through years of experience. They know exactly what you'll need and make sure that either you bring it or they provide it. The food is great. Everything went off without a hitch. But the guides are really the secret sauce. Taylor (lead), Makai, Aaron, and Stu were all really fantastic. These kids are smart, competent, efficient, friendly, and unfailingly patient and good-natured dealing with the guests. Western River obviously trains these guys up to manage the risks inherent in taking adults of varying experience and physical ability and kids whitewater rafting. There was never a minute we didn't feel we were in good hands. We went in late August so the whitewater was fairly tame. But it was fun and exciting nonetheless. 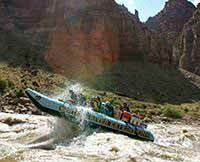 If you're looking for really wild water, do the Grand Canyon 7 day early in the season. For us, four days was perfect. 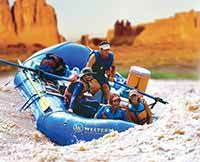 Net net, we had a great time and would recommend this trip to all but the most expert whitewater rowers.